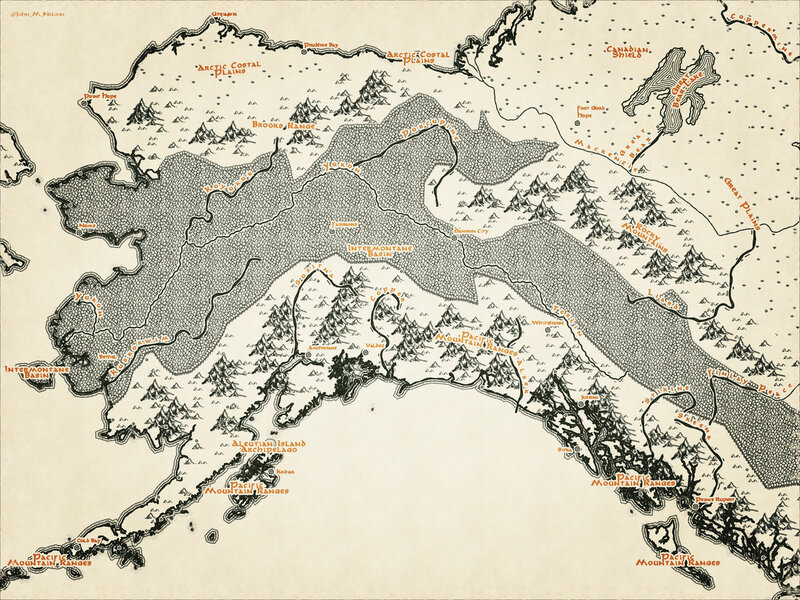 The two killer features of this hand-drawn cartographic style are the strongly linear mountain chains and the densely clustered discrete forests. If you are interested in trying out making digital Middle Earths, here is an ArcGIS Pro style file with all the doodads you’ll need. If you don’t run that, then here is a zip file with all of the textures and graphics that you can use to symbolize your layers. 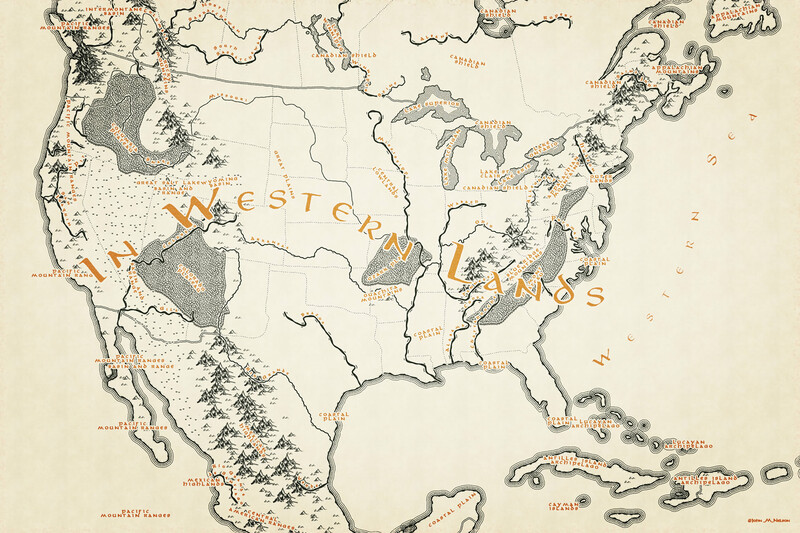 If you are interested in a bigger version with more details and more landcover types, here is a Tolkien-esque map of the Americas. I hope you give the style a try, or download the textures and build your own maps from scratch. 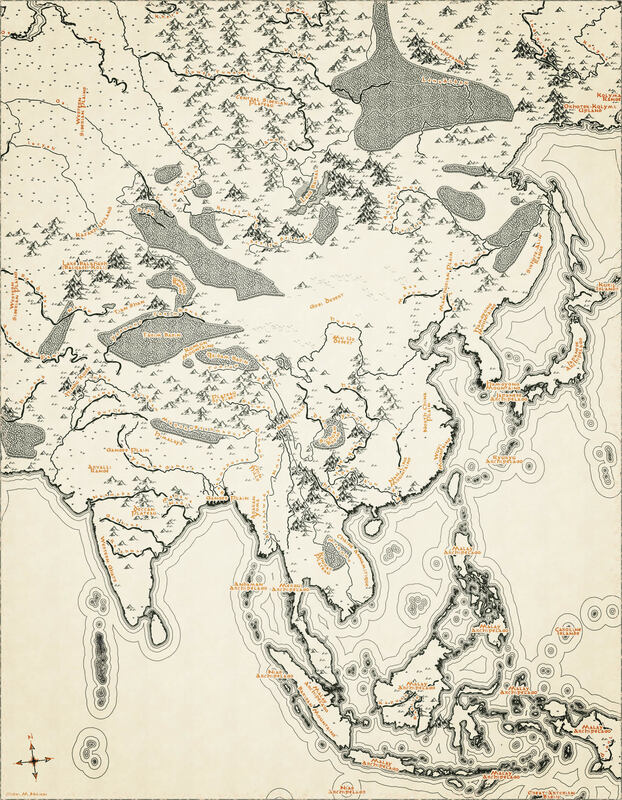 This map style has a built-in following of enthusiastic folks who were enchanted by maps from a young age. There’s no reason that enchantment has to stop at the back cover. I love maps!! !Thank you for creating this amazing blog. You, sir, are the Devil. Or genius; I can’t decide yet. You can use the images I link to to build your own map/style in your system of choice. You can just use them. What font are you using for the writing? Options to use this in ArcGIS Online? I made it in Pro, but it wouldn’t be hard to tile up for AGO. This blog is amazing! Both the content and the minimal design. Holy crap, I never knew that! thanks. I submitted this post to Hacker News, and lots of people loved reading it! There were a few people that might go off and make an Open Street Map tileserver with these wonderful graphics. Yes thanks Patrick! To export these as basemap tiles would be super simple. You just went from John Nelson the Grey, to John Nelson the White. Thanks for all the amazing blog posts. Your work is inspiring. Ha! Thanks Aaron. I didn’t even have to smite a Balrog’s ruin on a mountain to get there.